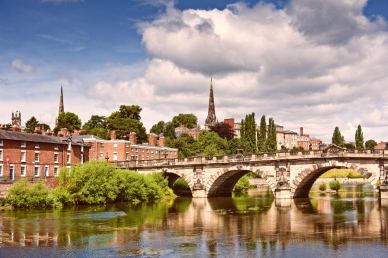 Amid the glorious countryside of the Welsh Marches, Shrewsbury, the county town of Shropshire, sits upon a hill protected within a loop of the River Severn. The little town is packed with charming shuts, cobbled streets, and just over six hundred antique listed buildings. To quote Pevsner and Newman’s The Buildings of England (2006): "With the spires of St Mary and St Alkmund, the towers of St Chad, St Julian and the New Market Hall . . . it is still easy to sense the prosperity and vigour of the Elizabethan and Stuart town, in the small market square half filled with the Old Market House, the twisting streets and attractive and curious courtyards and alleyways. Everywhere the street names are tempting and mysterious: Shoplatch and Murivance, Wyle Cop and Dogpole. Then, on the slope up from the centre to the park towards the west, genteel Georgian streets, of houses with spacious hidden gardens. ".